Play our true or false game to gather shapes and let you get acquainted with the many hidden secrets of the universe. The team brings you to one of the more popular mining spots, a dark cave located deep within the biggest forest in the universe. Though you are just getting acquainted with shape recognition, you are eager to get started on gem hunting! How fun and exciting it is going to be to collect treasures of many shapes and sizes! As you enter the cave with the team, you notice a shine and a shimmer at every corner. Upon closer inspection, you are amazed to see beautiful gems and jewels peeking brightly back at you. While the rest of the team works hard in getting the gems free from the rock formations, you are given the most important task: sort out the gems! To sort the gems out, you have to examine and recognize each shape that you come across. By recognizing the shapes, you can determine if the statement made matches the shape. Once you have determined if the statement is true or false in regards to the shape you have collected, you can go ahead and click on 'true' or 'false' to answer. By correctly identifying the shape and deciding whether the facts are accurate, you are helping the team collect the right gems with the right attributes. Shape Collector is a true or false game that trains you to analyze shapes and their characteristics. In this unit of inquiry, you will be identifying and sorting a range of basic forms and shapes. Shapes are an integral part of the learning process. We interact with shapes on a daily basis, therefore shape recognition is a fundamental skill required in the early math development, thus we have designed this true or false game to build that skill. Consistent training stimulates natural shape awareness and deciphers them into everyday environment. As you study each shape in question to determine if the statement made is true of false, you will build a stronger interest in shapes and their many unique attributes. This is vital for learning more complex geometry concepts in the near future. Because many shapes have such unique aspects to them, having keen attention to detail contributes to better results. 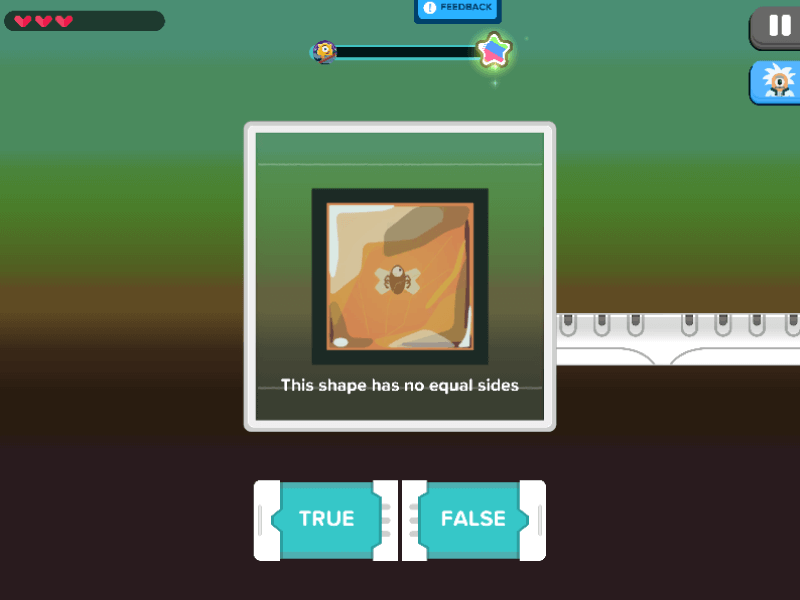 Though the gameplay of this true or false game is designed around a basic true or false examination concept, Shape Collector brings concentration and a practiced understanding of shapes to play, increasing a player’s knowledge of shapes and their properties in the form of recurring practice. Careful evaluation and proper analysis is promoted all throughout the game. This establishes a boost in math confidence as well as a steady progression in shape recognition. Are you game to sort right from wrong?